A work of fiction informed by history, Once There Was Fire is the story of Kamehameha the Great, who rose from inauspicious beginnings on the Big Island of Hawai'i in the mid-1700s to conquer the entire archipelago by 1810. The founder of the Kingdom of Hawaii, Kamehameha was born into a Neolithic society, unchanged for generations since the islands' settlement by voyagers from distant Polynesia a thousand years earlier. As a young man, Kamehameha witnessed the arrival in the Islands of the English explorer, James Cook, in 1779--a culturally seismic event for the Hawaiians. Kamehameha was the first among his people to grasp the transformative implications of Cook's visit, an understanding he would later turn to advantage in struggles with his rivals. Once There Was Fire brings a little-understood, historically remote era to life through the words and actions of its memorable characters: Kamehameha, his strong-willed and rebellious consort, Ka'ahumanu, his favorite brother, Keli'imaika'i, and Kamehameha's sons, nephews, comrades in arms, haole advisers, and bitter enemies. 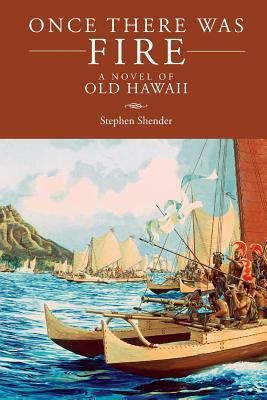 The novel invites readers to see Hawaii of the mid-18th and early 19th centuries as the old Hawaiians themselves might have seen and experienced it on the cusp of their passage from splendid isolation to the wider world. Stephen Shender worked as a reporter and editor for the Watsonville Register Pajaronian and the Santa Cruz Sentinel from 1977-93. He later worked as a political speechwriter in Washington, D.C., corporate speechwriter in Los Angeles, and marketing communications writer in Silicon Valley. A frequent visitor to Hawaii, Steve lives in Aptos with his wife, cat, and blue and gold macaw. Once There Was Fire is his first novel.